New research shows that ocean heat uptake across three oceans is the likely cause of the 'warming hiatus' ? the current decade-long slowdown in global surface warming. 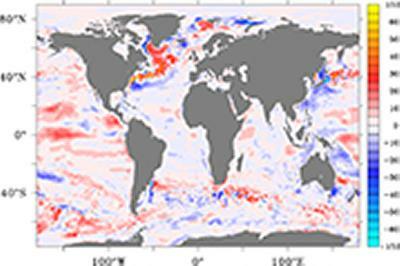 Using data from a range of state-of-the-art ocean and atmosphere models, the research shows that the increased oceanic heat drawdown in the equatorial Pacific, North Atlantic and Southern Ocean basins has played a significant role in the hiatus. The new analysis has been published in Geophysical Research Letters by Professor Sybren Drijfhout from the University of Southampton and collaborators from the National Oceanography Centre (NOC) Dr Adam Blaker, Professor Simon Josey, Dr George Nurser and Dr Bablu Sinha, together with Dr Magdalena Balmaseda from the European Centre for Medium Range Weather Forecasting (ECMWF). Previously, the drawdown of heat by the Equatorial Pacific Ocean over the hiatus period, due to cool sea-surface temperatures associated with a succession of cool-surface La Nina episodes, was thought to be sufficient to explain the hiatus. However, this new analysis reveals that the northern North Atlantic, the Southern Ocean and Equatorial Pacific Ocean are all important regions of ocean heat uptake. Each basin contributes a roughly equal amount to explaining the hiatus, but the mechanisms of heat drawdown are different and specific in each basin. In the North Atlantic, more heat has been retained at deep levels as a result of changes to both the ocean and atmospheric circulations, which have led to the winter atmosphere extracting less heat from the ocean. In the Southern Ocean, the extra drawdown of heat had gone unnoticed and is increasing on a much longer timescale (multi-decadal) than the other two regions (decadal). Here, gradual changes in the prevailing westerly winds have modified the ocean-atmosphere heat exchange, particularly in the Southern Indian Ocean.